This webinar event will focus on the upcoming 73 UN General Assembly taking place in New York from September 18 - October 5, 2018. 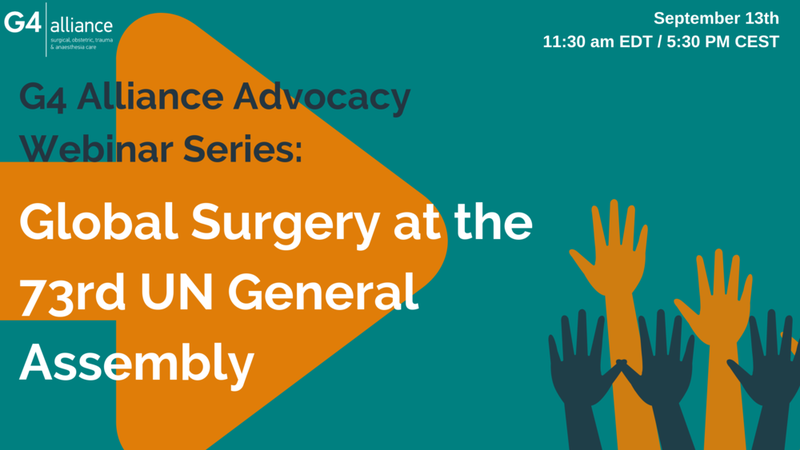 This webinar will highlight ways that YOU and your organization can support advocacy efforts in person and online during UNGA. We will also be highlighting relevant resources from the G4 Advocacy toolkit. Our goal is to ensure that surgical care is recognized as an essential component of universal health coverage and prioritized as part of the sustainable development agenda. Thanks to those who were able to join us for an exclusive sneak preview of the G4 Alliance Empowerment Database, an interactive platform designed to connect health workers, organizations, and patients in order to bring safe surgery to those who need it most! Over the past several years, interest in the field of global surgery has been growing, leading to increased medical, academic and political prioritization of this issue. Collaboration of surgical stakeholders represents an important strategy to effectively support surgical systems strengthening, capacity building and workforce training. However, effective coordination of international partners has represented a challenge from many non-profits, professional societies, medical missions and academic institutions. The resulting gaps and redundancies in coordination of healthcare delivery do not foster the needed sustainability required to empower local systems. The result is that opportunities and valuable human and material resources may be wasted and global healthcare not optimized. This is the challenge that International College of Surgeons (ICS) and their partner organizations are seeking to address with The G4 Alliance Empowerment Database: A Single Open-Source Registry of Available Surgery Resources. The registry is designed to overcome human resource barriers by creating a central, global registry of all medical professionals and stakeholders working to support surgical care delivery around the world. This innovative project was selected to receive the 2017 G4 Alliance Collaboration Prize, a $40K grant sponsored by the Henry Family Advised Fund to advance global surgery and increase collaboration among implementing organizations and practitioners. This Webinar featured presentations from the ICS and IntraHealth, as well as an interactive Q & A exchange. Thanks to all of those who were able to join us. Read more about the G4 Collaboration Prize and partners here.